BLOOMINGTON, In. -- About 4 miles south of downtown Bloomington, Ben Hertel helps a contractor find the perfect flowers for his client. The contractor has plenty of selections to choose from. Hertel’s employer, Bloomington Valley Nursery, has hundreds of flowers, houseplants, shrubs and trees for sale on its two-acre plot of land. Hertel and the rest of the nursery’s crew tend to the plants with a loving touch. Most of them are shipped in from as far away as Oregon, then maintained until they find a home in central Indiana. Hertel says he does everything he can to make sure the plants sold to clients are the healthiest they can be. 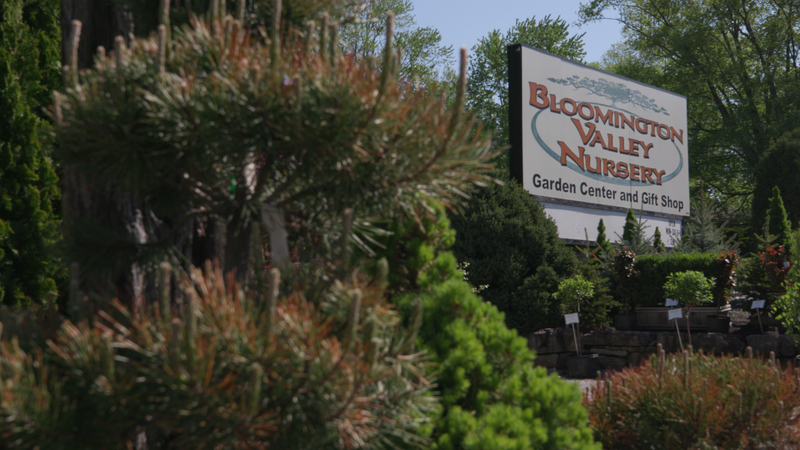 The Bloomington Valley Nursery uses glyphosates sparingly. Its crew recommends organic herbicides and pesticides. In Hertel’s five years at the nursery, he’s learned about the many techniques and products necessary to keep plants healthy and vibrant. One of most effective products in the nursery is Roundup, a herbicide used to kill unwanted weeds. Roundup’s main active ingredient is a chemical called glyphosate. Many other gardeners and farmers agree with Hertel. 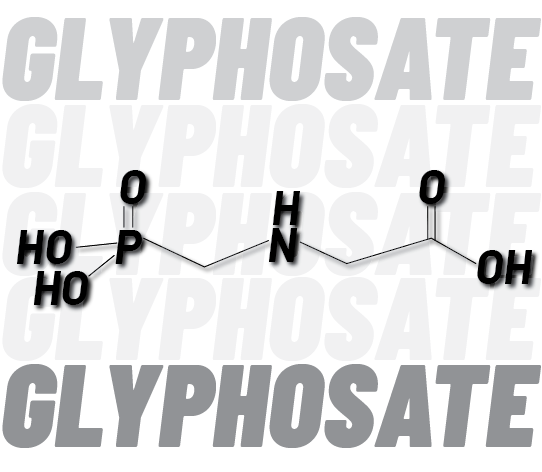 Glyphosate is the most popular weed-killing chemical in the United States. According to the U.S. Department of Agriculture, farmers around the country applied about 111,047,000 pounds of herbicides containing glyphosate to their wheat and soybean crops in 2017. At a minimum of $9.99 for a 5-ounce gel or up to $24.99 for 5 liters of garden weed killer, Roundup’s parent company, Monsanto Co., is profiting from its glyphosate-based products. There is no question that it is used extensively, but some researchers question whether the chemical has any harmful effects on humans. Herbicides containing glyphosate are sold across the globe. In an instructional video found on Roundup Brand’s YouTube channel, the makers say the product works by targeting an enzyme found in plants but not in people or pets. The chemical kills the weed by attacking its roots. After being treated, the weeds usually die off within several hours. The company claims that glyphosate is “one of the most thoroughly evaluated herbicide ingredients in the world,” and says the Environmental Protection Agency has determined that glyphosate poses no “unreasonable risk” to people, wildlife or the environment when properly used. One study based in Indiana has found evidence of an adverse health outcome linked to glyphosate that could change the way people think about the chemical. Dr. Shahid Parvez is an assistant professor at Indiana University-Purdue University Indianapolis’ Richard M. Fairbanks School of Public Health. He previously worked for the EPA in Cincinnati, where he studied disinfection byproducts and how they affect pregnant women. He now seeks to find out whether glyphosate is harmful to humans and under what circumstances. 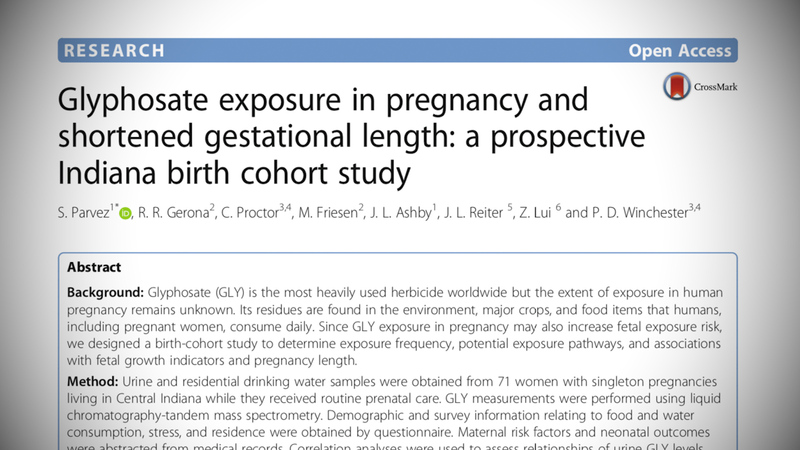 Parvez and colleagues set out to expand the amount of research by investigating the extent of exposure in central Indiana and how glyphosate affects humans in their earliest stages – during pregnancy. Dr. Shahid Parvez and other researchers studied how glyphosate affects humans during pregnancy. 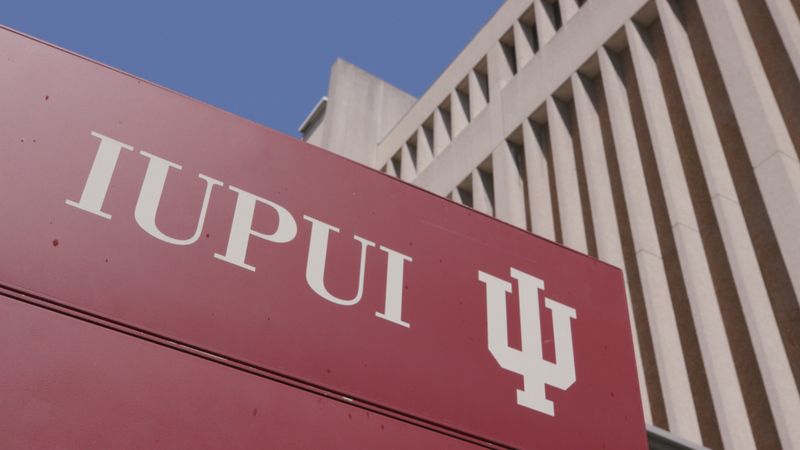 For this pilot study published in the journal Environmental Health, Parvez and his researchers randomly recruited 71 women from nine different counties in central Indiana and followed them through their pregnancy. The women were required to provide urine samples and unfiltered tap water samples from their home drinking water. The samples were analyzed to detect the presence of glyphosates. Parvez said the results were surprising. Parvez says the study allowed his team to collect evidence that people do not have to live close to agricultural fields and areas where glyphosate is used to be exposed to it. The researchers then set their sights on how the presence of glyphosate affected the women’s pregnancies. The researchers believed the sample size would be too small to find any link between the chemical and pregnancy outcomes. They were wrong. The average length of human gestation, or pregnancy period, is about 280 days. Shorter gestation periods can result in a baby not developing properly. Parvez says the link between glyphosate and gestation period is not conclusive. Parvez is aware of the limitations of his study. He says he hopes to get more funding to launch a larger study that includes people from even more parts of the state and with more diverse backgrounds. The research, he says, is important because of how many people would be affected. He knows that the health and livelihood of many people is at stake. 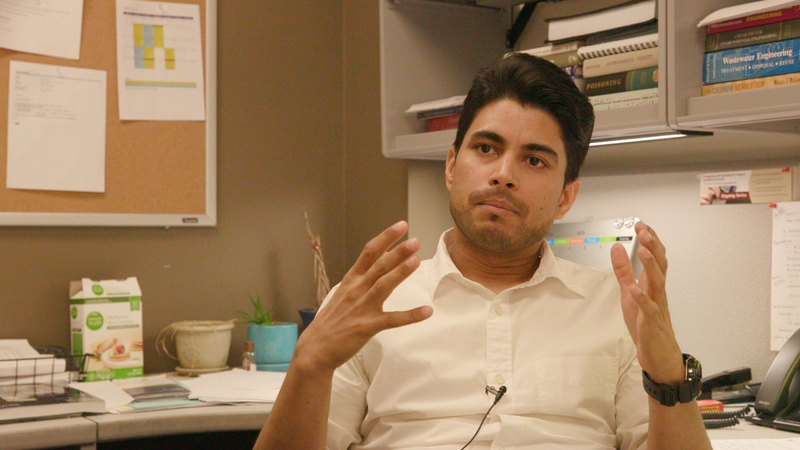 Parvez, an assistant professor at IUPUI, believes more research should be done on the effect glyphosate has on humans. Funding more research on glyphosate is essential. Parvez says glyphosate has been sold for decades, and research into the effects the chemical has on humans is still in its primitive stages. Parvez said farmers have emailed him asking him to be sensitive about speaking about glyphosate because negative attention could have an adverse effect on their business. For decades, researchers and government entities have had evolving sentiments about glyphosate safety and its effect on humans. In a preliminary assessment of glyphosate’s health and ecological risks released in April 2018, the EPA’s Health Effect Division stated that, in a review of other studies, researchers found no statistical evidence of an association between glyphosates and several types of cancer or tumors in people who directly used the product. The assessment directly goes against findings made outside the U.S. 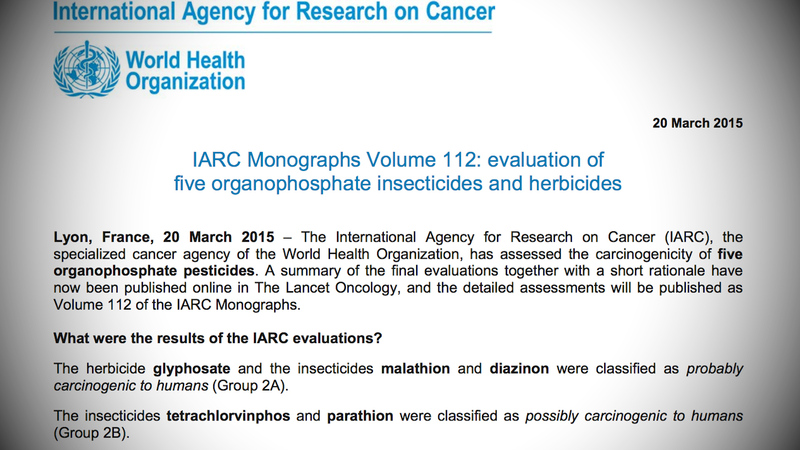 The World Health Organization’s International Agency for Research on Cancer classified glyphosate and two insecticides, malathion and diazinon, as “probably carcinogenic to humans.” The IARC report stated there was limited evidence of glyphosate’s carcinogenicity in humans for non-Hodgkins lymphoma, but clarified that there was “convincing evidence” that glyphosate can cause cancer in laboratory animals. The World Health Organization's International Agency for Research on Cancer declared glyphosate to be "probably carcinogenic to humans." State attorneys countered by saying California voters have already decided that the state should not be the sole entity to identify potential carcinogens and have “chosen to rely on the pre-existing and continuing work of an internationally recognized and world-government funded entity to identify potential carcinogens.” The court ruled against Monsanto, stating that the state did not abdicate its legislative authority by relying on the IARC’s findings. Monsanto also faces a lawsuit that seeks to find out whether the herbicide is responsible for a 46-year-old groundskeeper’s terminal cancer. In a lawsuit filed in the U.S. District Court for the Northern District of California, DeWayne Johnson, claims that Roundup is “manufactured, designed, and labeled in an unsafe, defective, and inherently dangerous manner.” This is the first court case allowed to proceed against Monsanto claiming that the company hid the carcinogenic dangers of its glyphosate products. German pharmaceutical company Bayer has since bought Monsanto and says it plans to retire the 117-year old Monsanto name as soon as the deal goes through regulatory approval. It is currently not known whether Bayer plans to continue the legal fight. If it does that could mean appealing to the U.S. Supreme Court. Glyphosates are still on the market, and federal agencies have taken notice about exposure beyond agricultural areas. The U.S. Food and Drug Administration has started testing soybeans, corn, milk and eggs for several pesticide residues. In a statement to Indiana Environmental Reporter FDA Press Officer Peter Cassell said preliminary results for the latest samples collected showed no pesticide residue violations. The FDA depends on the EPA’s assessment to determine tolerances or exemptions. In essence, if the EPA determines that a chemical has low risk of toxicity, then the FDA would allow more residue to be present. The tolerance is calculated using different models depending on the environment. Several different models are used for aquatic, terrestrial and atmospheric environmental exposure. Several models are also used to predict effects to humans from pesticide exposure. Tolerances vary depending on use. 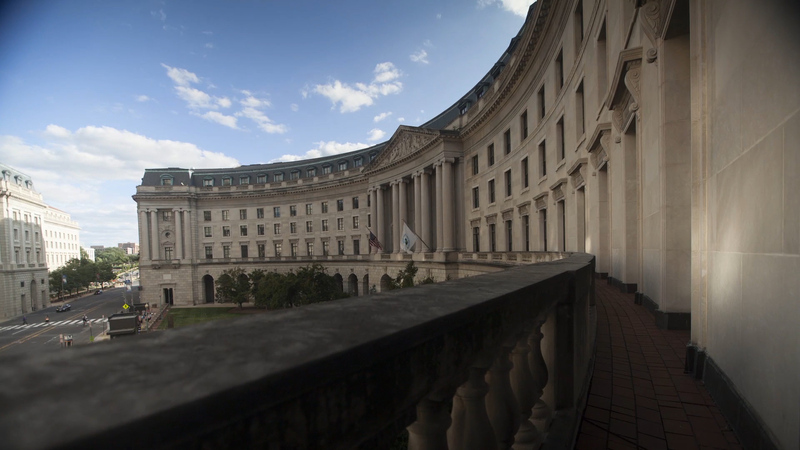 The William Jefferson Clinton Federal Building in Washington, D.C. is the home of the U.S. Environmental Protection Agency. For now, Hertel says he’ll try to steer his clients toward organic herbicide solutions until glyphosate safety is more conclusively researched. He says he sees the chemical’s benefit, but doesn’t like the health uncertainty. A jury trying the case of Dewayne Johnson v. Monsanto Co. ruled that the company’s glyphosate-based herbicide, Roundup, gave the former school groundskeeper terminal cancer and awarded him $289 million dollars in damages. The jury decided Johnson suffered more than $39 million dollars in personal losses and decided to award him a further $250 million dollars in punitive damages. Hundreds more plaintiffs, including cancer-sufferers, their family or estates, have filed lawsuits against the company. The result of Johnson’s case may affect whether those cases will proceed. A researcher from Indiana University Purdue University Indianapolis and his team studied the effect of glyphosate, one of the world's most commonly used herbicides, on pregnant women. The researchers found a statistically significant correlation between higher glyphosate levels and a shortening of pregnancy length. The company that makes Roundup, the world's leading herbicide containing glyphosate, says gestation ranges reported in the study are well within the normal ranges and the amounts of glyphosate found are well below the limits set by the EPA. Researchers say more studies should be done on the effect of glyphosate on humans.